Parents often ask me – will this year’s PSLE be harder or easier? My answer is that I do not know what questions will come out, but I do know our Singapore Examinations and Assessment Board sets a consistent standard, so do not worry. Perhaps the reason I get these questions is because we release ‘O’ and ‘A’ levels in the exam format. Even though we also release PSLE questions by topics, we have not released the papers in full. So students do not know the spread– that may be the reason. Hence, I am glad that SEAB has decided to release PSLE in the exam format too, so that students can have a better sense of the types and spread of questions that let all students show subject mastery, and prepare well – not to over-prepare and spend excessive time on drill-and-test, but to free up time for play, for exploring interest and holistic education; and not to under-prepare as PSLE can serve as a good gauge of their mastery of the subject, for the next phase of their learning journey. What matters most is for children to develop a love for learning. I hope this will help students better achieve their potential, and enjoy their learning. By the way, looking at the questions – these were different from what I recall I did as a student. The questions test concepts and understanding, how knowledge is applied to figure things out – much like what we have to do in real life. I am sure many parents, like me, will find it different – but then again, our children grow up in a different world from ours – when there was no internet, no smart phone. We have to look to the future, to prepare our children better. SINGAPORE - Primary Six pupils preparing for the Primary School Leaving Examinations (PSLE) will be able to attempt actual past year exam papers for the first time from this year. Currently, past year PSLE questions are published but categorised according to topics for maths and science, and item types for English and mother tongue languages. Publishing exam papers in full "will allow parents to have a clearer picture of the overall expectation of the PSLE", Singapore Examinations and Assessment Board (SEAB) chief executive Tan Lay Choo said on Friday. She added that the move will help parents "to understand the spread of questions from the basic, average, to the slightly more challenging questions". 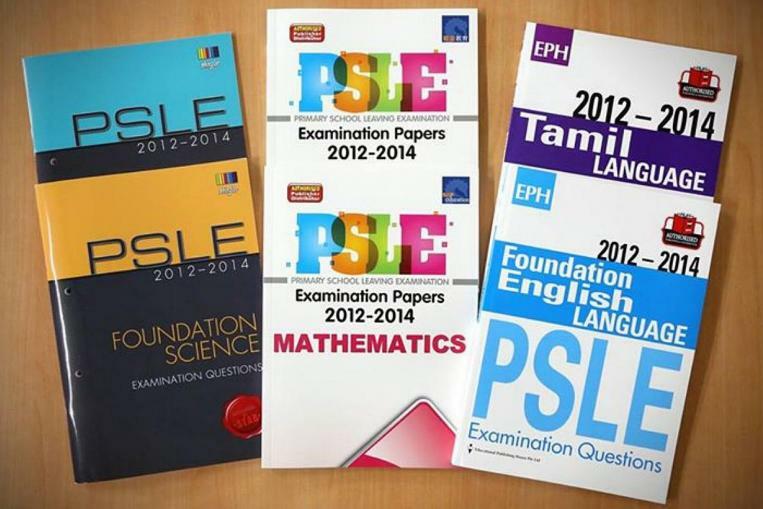 The booklets containing PSLE papers from 2012 to 2014 will be available in major bookstores from Saturday and will be priced between $2 and $4. 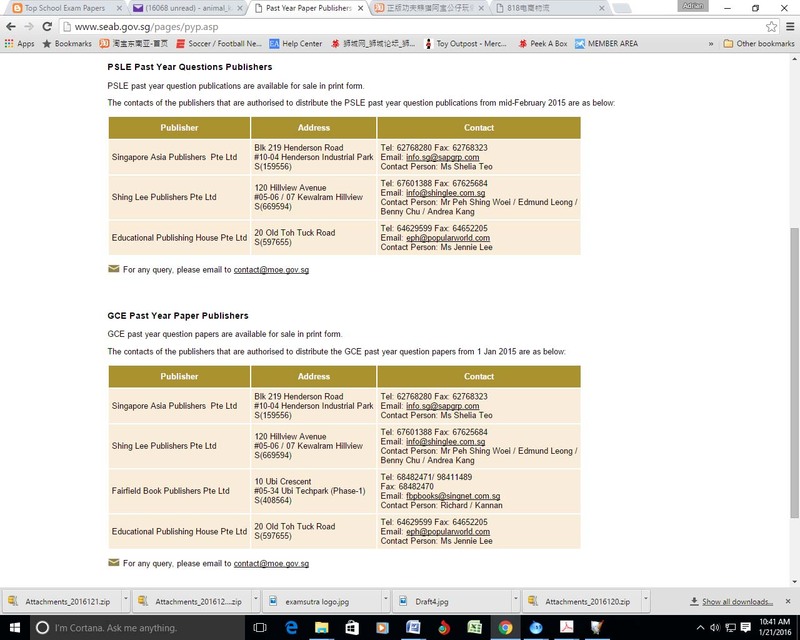 The SEAB will continue to release three years' worth of exam papers each year. The existing booklets, which release past year exam questions grouped according to topics and item types, will still remain on the shelves, the Education Ministry said yesterday. Answer sheets in the new booklets will contain only answers for multiple choice questions, or questions with a fixed answer. Ms Tan said the exam board accords some degree of flexibility in the marking of scripts, and will accept answers that "demonstrate an understanding of what we are testing". "It is very difficult for us to list... the possible answers for each (open-ended) question," she said. "Wherever we fall short, we are afraid that people will think we accept only these answers and not the rest." 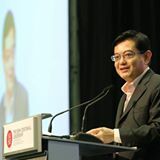 In a Facebook post, Education Minister Heng Swee Keat said the change will help students prepare well for the exams - "not to over-prepare and spend excessive time on drill-and-test, but to free up time for play... and not to under-prepare as PSLE can serve as a good gauge of their mastery of the subject for the next phase of their learning journey".